Nice Pull Down Menu with Pure CSS! 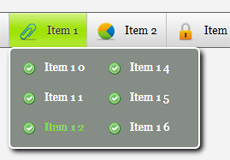 Can css3Menu be integrated in a PHP based website? I mean, can i dynamicaly add menu entries based on e.g. a MySQL database. Hello I use your software regularly to make simple web sites. Do you think a develop an accordion menu with sections to put text with opportunities to put links and pictures. Hi. I recently get the css3 menu free version to proof the product and I have a problem when publish the menu in my browser only appears the menu in letter not buttons.